I realized recently how often I use these terms in conversation without really explaining what they mean. Most people have heard the term, but unless you are a miner you may not really understand the difference. 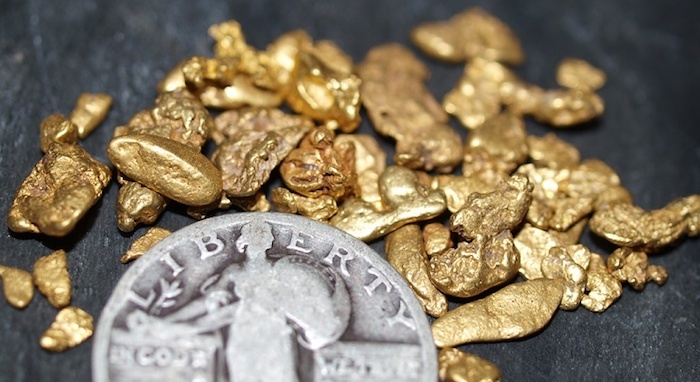 Here are the basic difference between these two types of gold deposits. The formation of gold doesn’t start in a river. It generally starts as a vein in rock. This is referred to as “lode gold” and this is the type of gold that nearly all commercial mines are after these days. There are many, many different types of lode gold deposits, which all require specialized mining techniques to mine and extract. For simplicity, its fair to simply summarize lode gold as being contained within rock. Placer gold is the gold that most prospectors are more familiar with. This is the dust, flakes and nuggets that you can find by panning and sluicing a creek or river. Placer gold might have some rock attached to it, but generally it will be clean from most rock material and will be worn relatively smooth. Erosion creates that typical “nugget” shape that we are all familiar with. Keep in mind that placer gold isn’t really any different than lode gold. It is simply a concentration of gold that is created from erosion and time. Placer gold accumulates over time when it erodes from hard rock veins. Gold dust doesn’t form in the river, it is transported there and forms concentrations. The origin of that gold is usually from a vein up on the mountain. Here is an example. Through geologic processes millions and millions of years ago, a gold vein forms in some type of rock. This vein is 10,000 feet up on a mountain and 20 feet under the ground. As time goes by natural erosion takes place. The rock over the vein is slowly eroding away, and after years it slowly crumbles away. Now we have an exposed vein of gold on the surface of the ground. It doesn’t take long for nature to take its course and a chunk of gold breaks off of the vein. Wind and rain occur, and this course chunk of vein material slowly erodes and starts to move. A once coarse specimen of gold in quartz starts to tumble and smooth. The quartz starts to break off and heavy rain events slowly moves it downhill. Eventually it makes its way into a small drainage. High water events continue to tumble and push it downstream. Millions of years go by, and a once coarse specimen becomes a smooth, polished gold nugget. What started as a gold vein eventually turns into placer gold. Which Type is Better for Miners? Gold is gold, so there isn’t necessarily a better type of gold. However, mining for lode gold has many more challenges that mining for placer gold. Placer gold mining is much easier. The gold is already separated from the rock, and gravity has concentrated the gold into creeks and rivers where it is more easily accessible. All the prospector needs is some simple tools, a gold pan and maybe a sluice box and they are ready to start mining. Lode gold takes a lot more equipment and generally a lot more expense. Since the gold is locked up in rock it is usually pretty hard to get to. Even if a miner locates an exposed vein on the surface (which is sometimes done by using a metal detector), following that vein and processing the ore as it goes into the Earth is quite challenging. It can be much more expensive to mine these deposits than the gold that you will recover much of the time. For the average gold prospector it is usually better to spend your time focused on placer gold.